Lecture is a Power Point based performance series that explains an exhibition in subjective terms, via a series of google searches, personal anecdotes, and expert consultations. Cécile B. Evans is a Belgian American artist based in Berlin. Her work examines how emotions are valued in contemporary society. 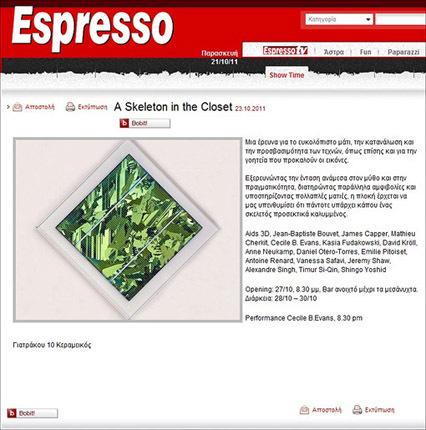 Evans has exhibited internationally at places such as Spencer Brownstone Gallery in New York (solo), ReMap3 in Athens (performance), Wilkinson Gallery in London (group), and Bergen Kunstmuseum in Norway (group). This year she will participate in the Frieze Art Fair as the recipient of the Emdash Award.